Another Wednesday, another “What I Ate Wednesday” post! I hope you guys are enjoying reading these as much as I enjoy writing them. I’ve pre-written and scheduled this post; as you’re reading this I’m actually in Morocco and enjoying some delicious local delicacies (that’s what I’m hoping anyway). I’ll be sure to share a WIAW post about my trip in Morocco next time, but firstly here’s a look at what I eat in a typical day. 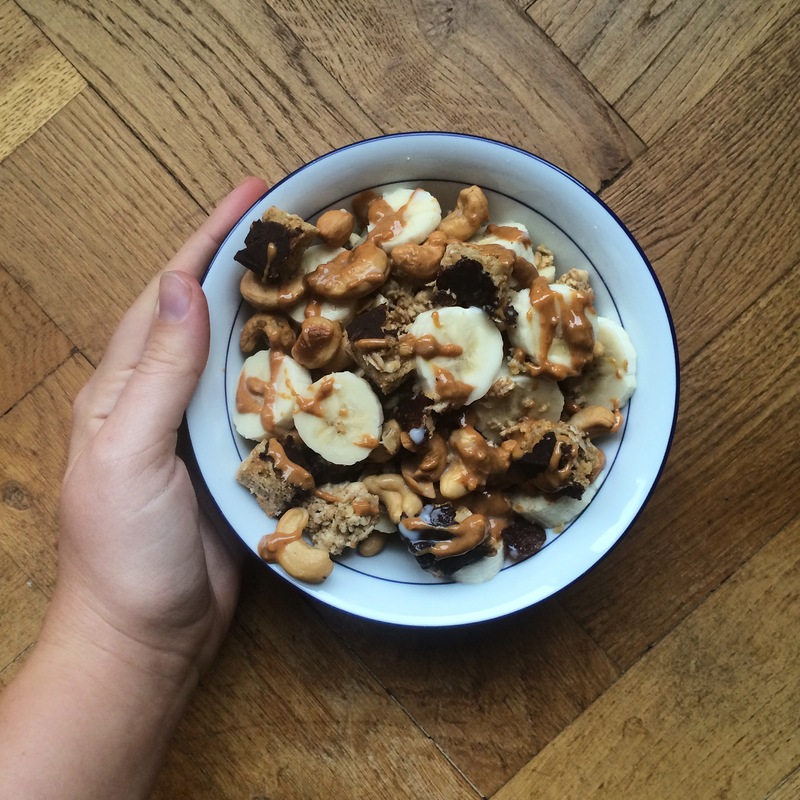 Recently my favourite breakfasts have been what I call “messy bowl breakfasts”. Basically I take a bunch of ingredients I have, throw them in a bowl and add almond milk; it’s the ultimate bowl of cereal. This time I went for cinnamon granola, banana, cashew nuts, half a TREK coconut protein flapjack and peanut butter. This is also a great source of protein (because no, vegans are not protein deficient). I made a big loaf of banana bread over the weekend, and paired with some vegan whipped cream this is such a yummy snack to accompany my coffee. 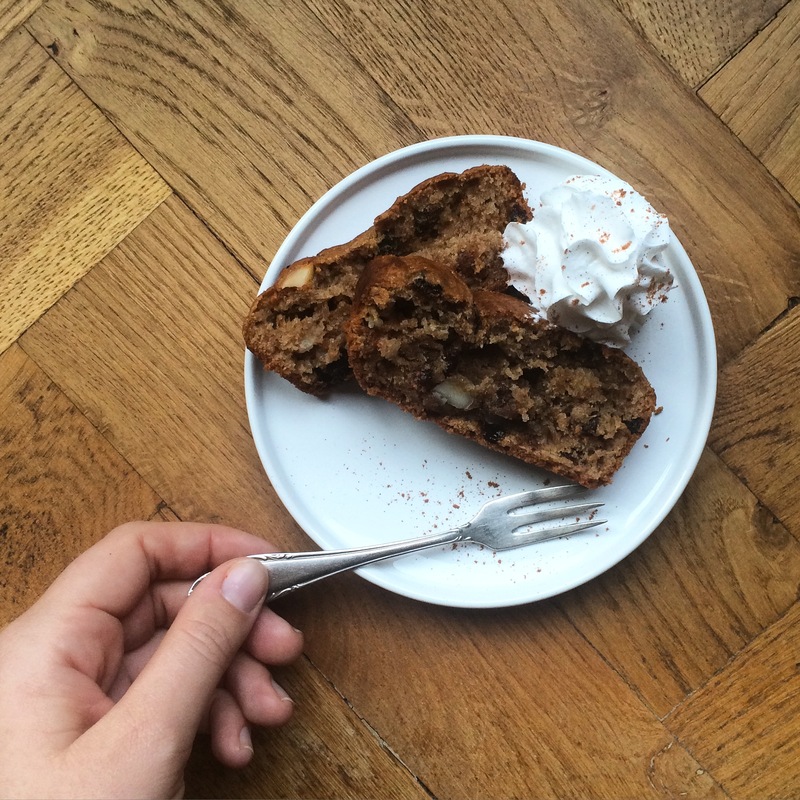 I posted my recipe for banana bread a while ago, check it out! I was craving carbs for lunch, so that’s what I went for. 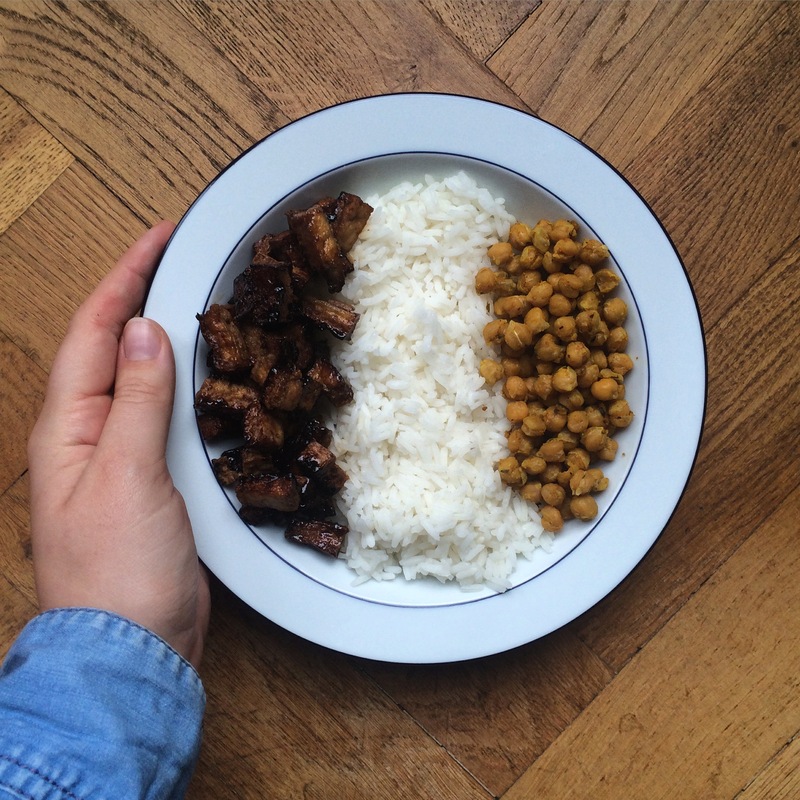 I enjoyed a big bowl of white rice, paired with some tofu baked in soy cause and roasted spiced chickpeas (the recipe for these will be up soon!). 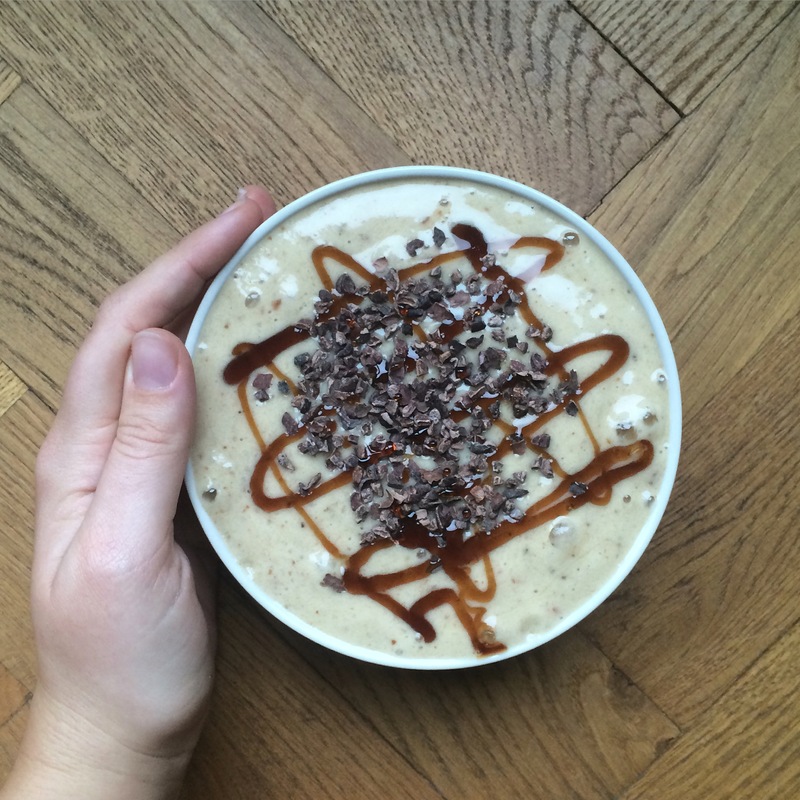 I can’t get through an afternoon without a snack; this time I went for a banana and date smoothie bowl. I blended two frozen bananas, one regular banana and three dates. Topped with cacao nibs and caramel syrup, this really satisfied my sweet tooth. You can’t have too much rice in a day, so for dinner I went with white rice again, this time pared with a red curry. 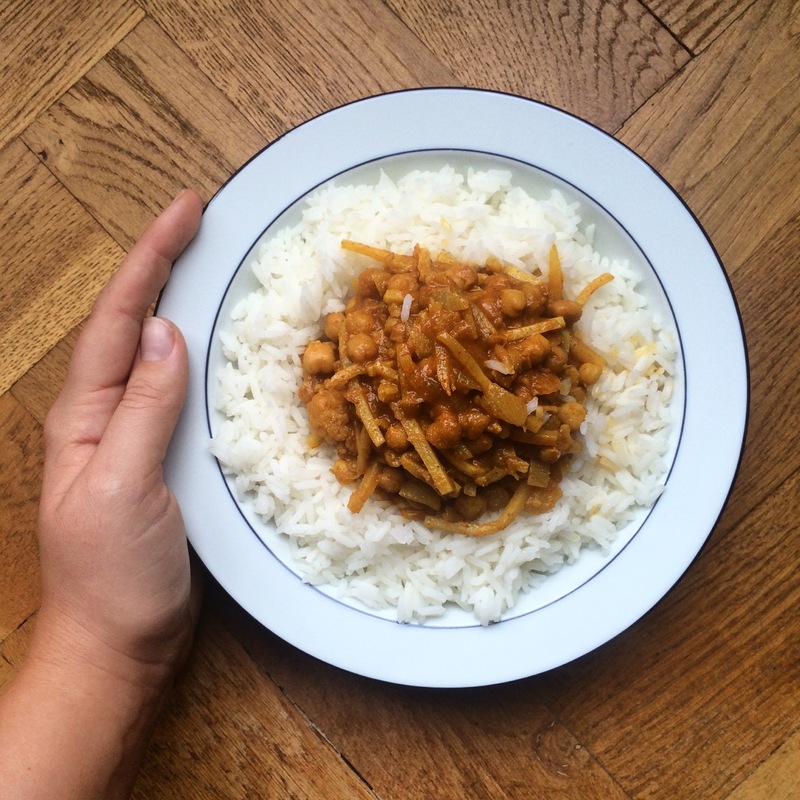 I love curry; this time I made a yellow curry with chickpeas, cauliflower and bamboo shoots. I used a Fairtrade curry paste this time, but I’m experimenting with making my own paste. Do you have any suggestions?